What would be your reaction if your tour can be guided by a string of Emojis telling you which part of your travel destination is favourite among frequent travellers for different reasons? Which destination gives them joy, which gives them peace and which is just so beautiful that you would want to stay there forever? 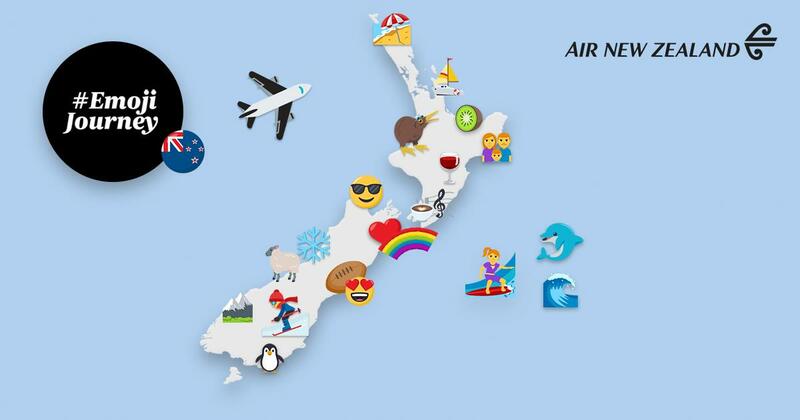 Read about Air New Zealand new Emoji Journey which aims to do just the same. In a world filled with mobile phones and instant communication, the use of emojis is – unsurprisingly - becoming an ever-increasing way to connect with each other. On average, 3.5 billion emojis are used on Twitter every month! As the saying goes "a picture is worth a thousand words", and although emojis aren't exactly a full picture, they certainly can be used to quickly convey emotions, activities and so much more between senders. Now, brands are starting to use the miniature expressive icons in new ways to connect with as well as assist and educate their customer audience. One such brand is airline Air New Zealand, who are harnessing the power of the emoji for their new Emoji Journey planner. An interactive, online map and guide of New Zealand, it allows users to explore the best of New Zealand through the emojis the input. Additionally, users who comment back to the airlines Facebook (https://www.facebook.com/airnzuk/videos/10156246009304047) and Twitter (https://twitter.com/airnzuk/status/964552465164234752) posts with their preferred emoji activities will be sent a personalised map back with highlighted, points of interest to them. Clicking on these emoji points of interest will then provide the user with more information about the destinations and activities including recommended places to shop, eat and drink, where to enjoy art and culture and the best places to go for outdoor or adventure pursuits. Aimed at young people, millennials and Generation Z in particular, Air New Zealand are using the guide to inspire travel to and within New Zealand. According to the Air New Zealand Global Brand Manager Jodi Williams states that "This is a fun and unique way to showcase New Zealand and our regions, from skiing at Ruapehu, rafting in Rotorua, or whale watching in Kaikoura, to the iconic Len Lye Centre in New Plymouth, or some of the country's foodie hotspots. For example, if I wanted to head to one of New Zealand's renowned wine regions I would enter the wine emoji." Other airlines such as British Airways and Norwegian Air have also experimented with campaigns that use emojis in the past. Air New Zealand are the latest to use them to modernise their native and global customers online experience. Williams further states, "We're committed to enhancing the customer experience and leading the way when it comes to innovation. #EmojiJourney will be progressively launched in our global markets in English, Japanese, German and Chinese and we hope this new experience will not only inspire visitors to travel to New Zealand but will also get Kiwis out exploring their own backyard."